NASA’ Former chief operating officer in Spain Carlos González Pintado says there could be life on Kepler-452b — the newly remarkable world discovered by NASA’ kepler mission — given its characteristics. Kepler-452b is located 1,400 light-years away from us and it has some intriguing features very similar to our own blue planet. Kepler 452b, which is about 60% larger in diameter than Earth, is located in the constellation Cygnus. Based on its size, scientists believe that Kepler-452b is a rocky world though this theory is based on statistical analysis and computer models not on direct evidence. said Pintado in an interview. mathematically speaking, there’s high possibility that could be intelligent life on kepler-452b. said Seth Shostak ~ one of the researchers involved in the discovery. Personally, given the line of work I’m in, I think that’s a very encouraging thing. Each one we find helps us to answer the question of what fraction of the sky has planets that are cousins of our own. That fraction is looking pretty promising. It’s not one in a million. It’s not one in a thousand … It may be more like one in two or one in five. ♦ It’s the smallest exoplanet discovered to date discovered orbiting in the habitable zone of a G2-class star just like the Earth and the Sun. 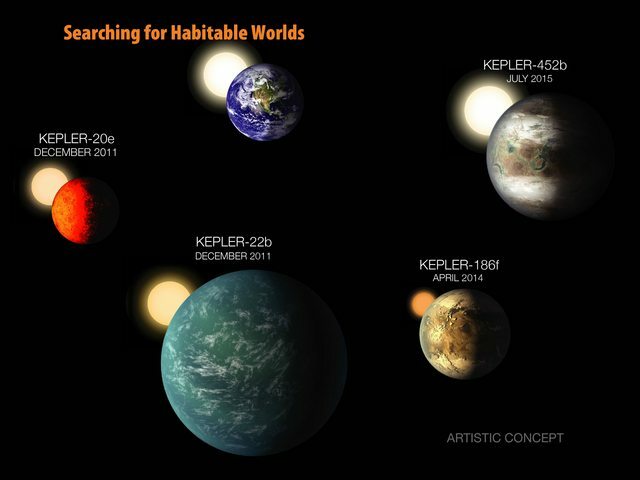 ♦ Kepler-452b is 60 percent larger in diameter than Earth and is considered a super-Earth-size planet. It’s likely rocky. ♦ While Kepler-452b is larger than Earth, its 385-day orbit is only 5 percent longer. ♦ The planet is 5 percent farther from its parent star Kepler-452 than Earth is from the Sun. ♦ Kepler-452 is 6 billion years old, 1.5 billion years older than our sun, has the same temperature, and is 20 percent brighter and has a diameter 10 percent larger. ♦ The Kepler-452 system is located 1,400 light-years away in the constellation Cygnus. So I think this really gives you something to aim for. Kepler is the first step. We’re finding out if planets like Earth are common – and the answer seems, so far, to be yes. We move in four dimensions and to get something extraordinary we have to find some ‘new’ dimensions. Some theorists believe that the universe must have eleven dimensions and we are at the dawn, we ‘discovered’ just four and nothing more. When we would find the other missing seven, maybe we’ll find something in the middle to break the barrier of speed of light. In addition to Kepler-452b, another 521 planet candidates have been added to the mission’s checklist – including 12 candidates that appear to be one to two times as wide as Earth and orbit in their parent stars’ habitable zones. Nine of the stars are similar to our own sun in size and temperature. Is any possability for us to live on??? ?